How can anyone offer words of comfort for sympathy in the face of the great losses people suffer? It is helpful to remember that while our words of comfort sympathy are indeed small compared to the pain, sympathy messages are still important. If you are trying to be supportive of a friend or loved one who is going through grief, it can be hard to know what they are going through. The ups and downs of the emotions of grief can be hard for someone to understand when they themselves are not experiencing it. 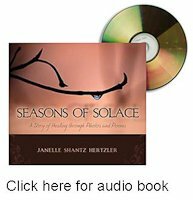 Listening to the following audio book is a helpful way to get an insiders view of what grief can be like. Although it is marketed for those in grief, many people who are not in the midst of grief themselves have found it helpful in learning how to relate to their loved one's experience. Beyond words?? Check out our Sympathy Flower Section. Or send a Sympathy Card made with a photo that I took during my grief journey. These images offer the therapeutic element of nature while not denying the pain of grief. In her book When People Grieve, Paula D’Arcy talks about what it was like to first meet people who had not yet seen her in person to acknowledge her husband’s death. She tells how many people had a hard time looking her in the eye. She says what she needed most was 'someone to look into her eyes and say, "I’m so sorry." Only looking into the raw truth of things had the power to make a difference. She says to others these words may have felt inadequate, but it is the act of acknowledging the loss that mattered. Here is a page about finding the right words to express sympathy when meeting or visiting the bereaved. One way to express sympathy is through an sympathy inspirational gift, which gives people permission to be honest with their pain and find hope and healing through the struggle. Looking for a way to give your memories to the deceased's family in one of the most unique of personalized sympathy gifts. Need to chat with a live person about supporting a bereaved friend or family member? Read our Online Grief Counseling Interviews. These counselors are also happy to offer wisdom and advice to those who are supporting others in grief.